Three weeks ago, I received an email from YesStyle and I was happy to read that I was selected to try their YesStyle Beauty Box*. 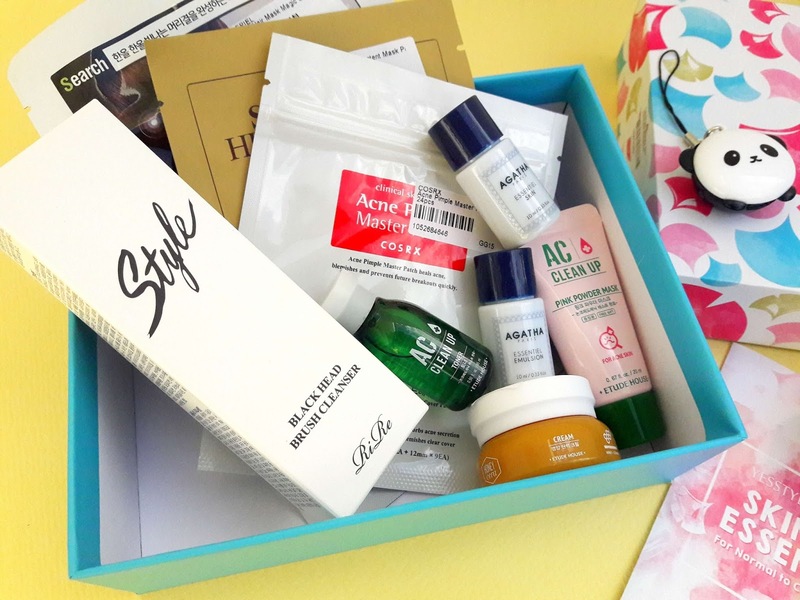 To my surprise, this beauty box arrived exactly two weeks later from the dispatch date which is pretty amazing taking into consideration that any package from an Asian country usually arrives a month later (maybe more) in my country. 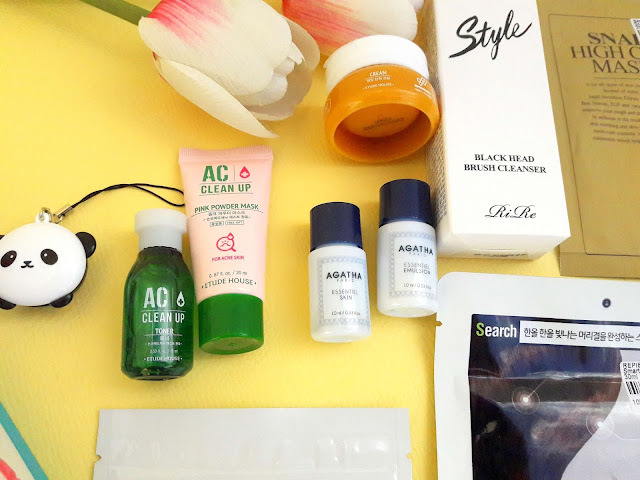 I wanted to try Korean skincare products for so long so I also placed an order from the YesStyle shop, which I already received but haven't tried any of the products I ordered yet. YesStyle shop offers International shipping for orders more than $35 which is pretty amazing and of course, my order was huge and if you consider placing an order, make sure you check their sales and offers. 1. RiRe Style Black Head Brush Cleanser (20ml) | Full Size: this product is the one I am most curious and excited to use since I love cleansers. It has a silicon brush attached to it which is suppose to remove blackheads, whiteheads and oils from face and deep clean pores. It has black sesame, soybean, rice and jojoba seed oil plus macadamia oil to moisture skin. 2. Etude House AC Clean Up Toner (15ml) | Sample Size: I haven't tried any products from Etude House before so this is a first. This toner is enriched with salicylic acid and hinoky cypress extract to help treat and soothe blemishes. This toner has a strong scent due to the high alcohol content which doesn't make me happy or excited to use it. 3. Etude House AC Clean Up Pink Powder Mask (20ml) | Sample Size: this is a clay-based mask with kaolin, salicylic acid hinoki cypress to clean pores and fight blemishes, the same action as the toner. It can be used all over the face or as a spot treatment. I don't know how the toner or mask will help me since I don't have acne or blemishes and I believe that these products are designed for younger people not for 30plus. I would love to try anti-ageing products instead as they would fit better in my skin's needs. I will keep these products for when I have my period and have a pimple or two but I have no intention in using these products daily. 4. 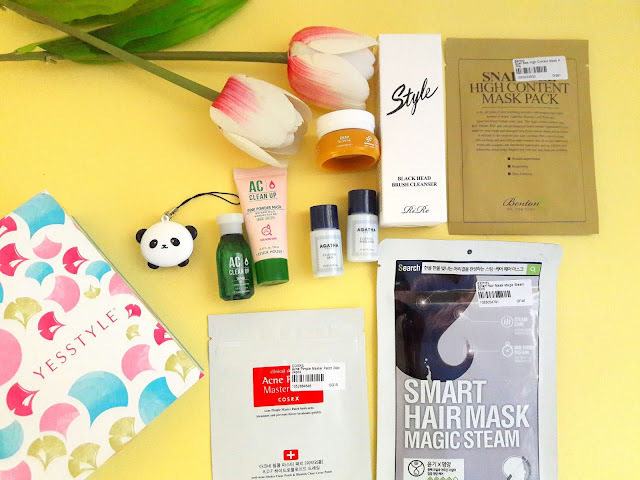 Benton Snail Bee High Content Mask Pack (20g) | Full Size: this mask is formulated with nail filtrate, bee venom, and instead of water, they used camellia leaf water. You apply it and relax for 15 minutes and it promises to soothe damaged skin, give a cooling effect and also moisturize and 'lift' skin and fight wrinkles. A multi-task mask? We will see. 5. 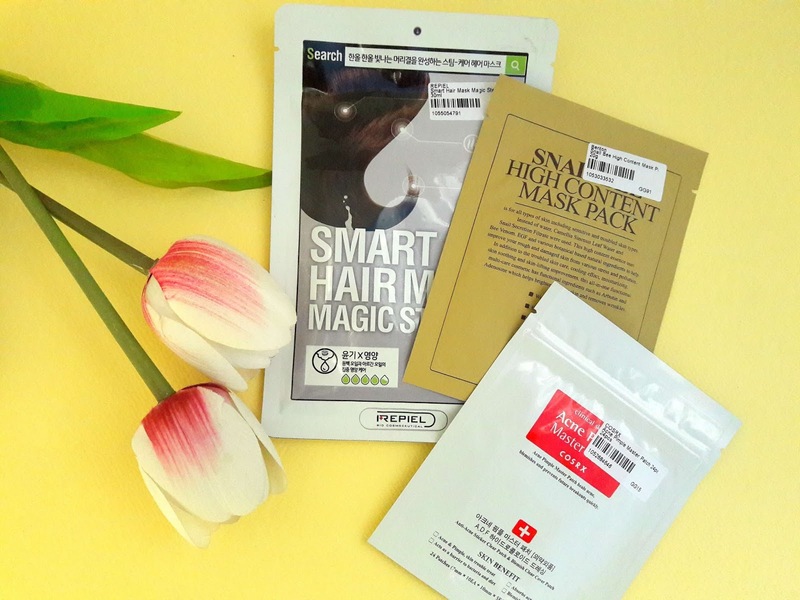 REPIEL Smart Hair Mask Magic Steam | Full Size: I haven't heard of this brand before nor I read any reviews on their products. This hair mask has collagen, hydrolyzed keratin, tsubaki and argan oil to restore luster and shine and give life to dull and frizzy hair. To use this mask, wash and towel dry your hair and apply the mask. Wrap the mask around the head and properly seal it with the sticker. Leave it on for 10 to 15 minutes and remove using lukewarm water. 6. COSRX Acne Pimple Master Patch (1 sheet /24 pieces) | Full Size: Again, this product is for those who suffer from pimples so I am not going to use it soon. These are hydrocolloid patches that help reduce the appearance of pimples and speed up healing. Each packaging comes with 1 sheet and 24 patches in different sizes. 7. AGATHA Essentiel Emulsion (10ml) | Sample Size: this is a product I am excited to try since I love products with rose extracts. This emulsion is designed to provide hydration and nourish skin it is best to use after cleansing and toning. 8. 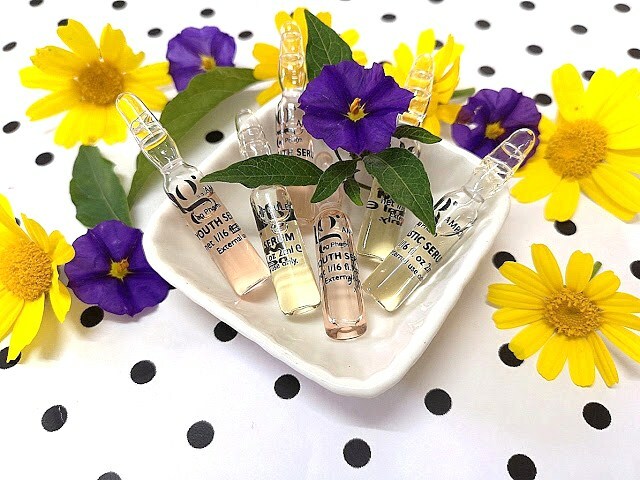 AGATHA Essentiel Skin (10ml) | Sample Size: this is a lightweight essence-type lotion that has the same ingredients like the emulsion (rose extracts and red flower complex) and delivers lasting hydration to the skin. I am curious to try both products from Agatha so stay tuned for a review. 9. Etude House Honey Cera Cream (10ml) | Sample Size: this is a moisturizing cream with shea butter, royal jelly, honey extract and ceramides that work together to moisture and firm up skin, increase elasticity and leave a glow on the skin. This cream would be perfect to use now since my skin is dry due to the cold weather so I am putting this to the test asap. 10. Tony Moly Panda's Dream Pocket Lip Balm (3.8g) | Full Size: how cute is this lip balm? I don't own anything like this and the child in me was super happy when I found this product at the bottom of the box. I will keep this in my bag to use it every time I feel my lips dry during the day since it promises to leave lips soft, smooth and super moisturized. 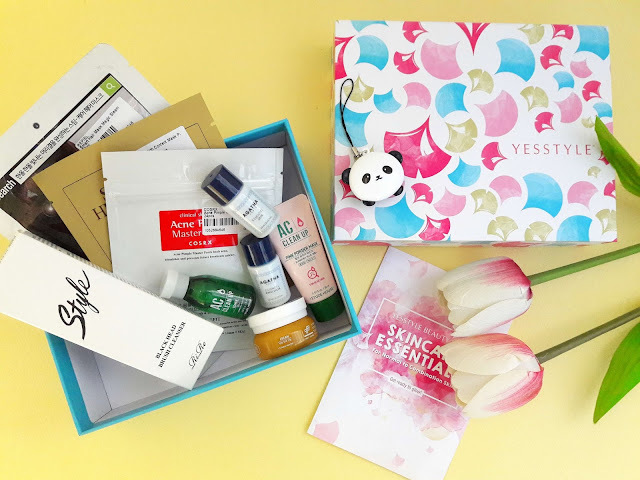 This is a lovely beauty box for those who haven't purchased korean skincare before and want to give them a try, however, I find that the target group for this box is people aged 20+. 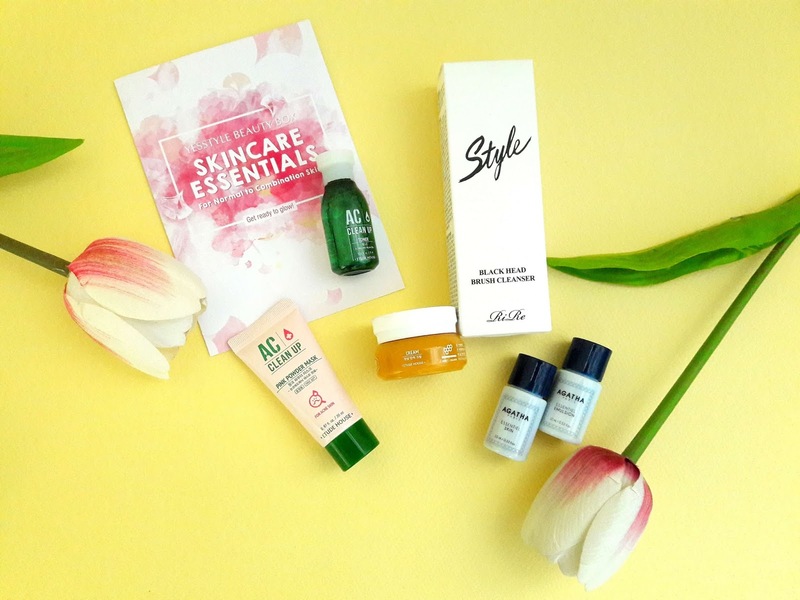 As I mentioned above, I would love to receive products more appropriate for my skin's needs. Also, the fact that the face masks count as full size items is a little disappointing since I will only use them once. The price ($34.93) is quite expensive since you get lots of samples that won't last for long so I think I wouldn't purchase this beauty box myself but I would rather order products suitable for my skin instead of receiving random products that may not use. 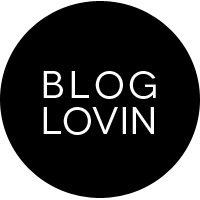 If you want to sign up and get picked to try their next beauty box, you can sign up here. * I received this beauty box for free but all opinions are my own and 100% honest.